While no one can predict with complete accuracy when or if a recession will hit, businesses are in in preparation mode for an anticipated economic downturn—it’s clear the end is near for our near-decade-long burst of economic growth. For many organizations, preparing means taking many predictable steps: slashing resources, shutting down long-term innovation investments and shifting focus to short-term priorities. But a challenging economic environment calls for the need to innovate more, not less. Business leaders should look to capitalize on recessionary cycles to set a strategic course for sunnier days. In good times – and especially in bad – innovation remains a critical lever for organizations to achieve their long-term strategic objectives. But when the economy tumbles, it is especially important that companies approach innovation in a strategic and thoughtful way because the margin for error decreases as times get tough. A strategic innovation plan will help companies do more with less and continue to move forward. Drive the innovation agenda. Truly successful innovation efforts always start at the top. 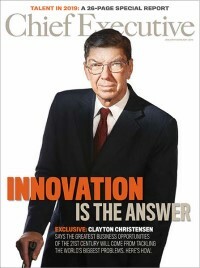 CEOs must drive the innovation agenda during and through a downturn. Rather than slashing innovation budgets in a recessionary economy, CEOs should encourage management and teams to prioritize market-leading products and services in line with the business strategy. Innovate with purpose. When facing a downturn, organizations would do well to prioritize investments in a way that moves beyond just profitability and centers on its core purpose. A report by the Economist Intelligence Unit revealed a distinct connection between purpose and innovation. Sixty-three percent of executives from across three global industries believed that having a sense of purpose and aspiration beyond their day-to-day commercial mission made their company more innovative and more able to disrupt or respond to disruption. Be ruthless in prioritizing. Strategically prioritize innovation investments in a downturn. When resources are scarce, avoid “walking dead” projects and instead be ruthless about making decisions on when to pull the plug. Leaders should be asking key questions such as “How much risk remains?”, “What’s the upside potential of the investment?” and “What is the true cost of the next round of tests and what learning will they provide?” Conduct a portfolio scan to uncover projects that are over budget, support unprofitable business lines, or are just not a good match with current or future customer needs. Avoid the temptation to prioritize short-term efforts that promise immediate payback over longer-term efforts with more questionable payback. Potential rather than performance alone is the right guide for innovation decisions. Focusing solely on the immediate, core business can lead companies to diminishing returns from investments while missing great growth opportunities. Innovation isn’t just about creativity and generating new ideas. It starts by aligning innovation investments with the firm strategy – critical when making priority decisions and outcomes that matter to clients and the bottom line. Focus on “adjacency innovation”. In a downturn, business leaders must figure out how to do more with less, which requires different thinking about innovation management. Rather than make big bets on a single, radical innovation, companies can consider allocating resources to an “adjacency innovation,” which can be less risky but still generate good pay-offs. Doing so requires using core competencies to move beyond the current business into a space that is adjacent. Examples include taking an existing product to a new customer segment or serving an existing customer with a new product.